We envision a network of institutions, communities and individuals working together for excellence in community-based research, culturally-responsive approaches, and action-oriented solutions to HIV and AIDS affecting First Nations, Inuit and Métis Peoples in Canada. The AHA Centre builds capacity in and supports culturally-responsive community-based HIV and determinants of health research through meaningful engagement with First Nations, Inuit and Métis Peoples living with HIV, communities, researchers and policy makers while utilizing knowledge translation to inform evidence-driven action. ​With a leadership team of highly respected community members, researchers, and Elders, the AHA Centre is governed by a team with an exceptional track record of working with Indigenous communities. 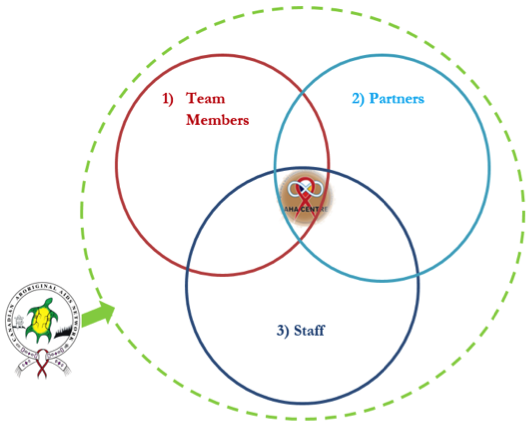 Partners of the AHA Center: Organizations and centres working in the fields of HIV and AIDS, STBBIs, Indigenous Health and related areas of research. Staff of the AHA Centre: Staff members are the heart of the AHA Centre and work closely with the Operations team (co-Directors and CAAN CEO) to ensure smooth operations. Red: Governing Council; Principal KUs/Is; Co-KUs/Is; Collaborators. Blue: AHA Centre Partners. Navy: Staff/Ops Team. Green: CAAN.